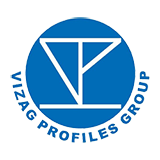 Vizag Profiles Group” engaged in Steel handling, trading and manufacture, over two decades forayed into Property Development & Construction activity to show case its capability in handling construction Projects. The group company “Steel Exchange India Ltd.,” a listed company has turnover of over Rs.1500 Crores for the Current Financial Year, manufacturer of “Simhadri TMT”, is one of the largest steel producing integrated steel plants in south India in secondary steel segment. The Company has captive power generation facility with capacity of 60 MW.